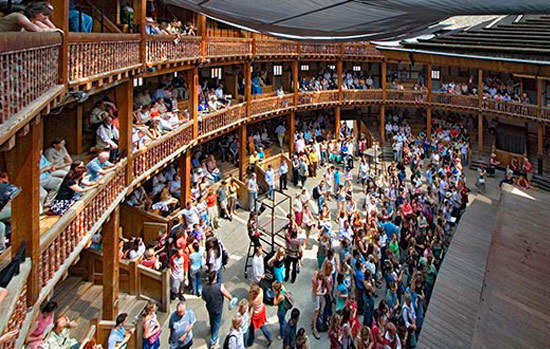 In 1613, an Elizabethan playhouse called The Globe Theatre was destroyed due to fire. It was then reconstructed into the "Shakespeare's Globe". It is located in the London Borough of Southwark.It is located on the south bank of the Thames river. Sam Wanamaker (Director and Actor) was the founder of the Shakespeare's Globe. The new structure was built two hundered and thirty meters or seven hundered fifty feet from the place where the globe theatre was situated. In August 1996, the Shakespeare's theatre was opened to the public with 'Prologue production' (by Jack Shepard) of The 2 Gentlemen of Verona. In this Proteus was played by Mark Rylance. In the year of 1997, the formal opening, Gala, was held. The playing company (Lord Chamberlain's men), to which Shakespeare belonged, built the original theatrecalled The Globe Theatre. This was done in 1599. This caught fire on 29th June 1613 and was destroyed. During a production of Henry VIII, this fire triggered due to an accident with a cannon. In 1614, the theatre was rebuilt but in 1642, due to the pressure of Puritan opinion it was closed and in1644, it was demolished. Where is Shakespeare's globe located ? The theatre will be closed on 24th and 25th December every year. During occasional maintenance work and during matinee shows, there wont be access to the theatre. Visitors are taken to a nearby archeological site of the Rose, Bankside's first playhouse. Very nice food and drink is provided by Swan at the Globe. Ingredients are purchased from local markets and farmers. Lot of tasty snacks, hot drinks and sandwiches will be available all day. One of the attractive places in the Shakespeare's theatre is The Brasserie and it can be hired for private events. How to get to Shakespeare's Globe ? The best way to go to Shakespeare's Globe is by walking till it. From Southwark bridge and Waterloo there are very convinient walk ways. The Millennium Footbridge is 50 metres away from the Theatre. A point to note is that a small segment of the Thames Path is closed at Blackfriars until the end of 2011. There are good diversion signposts. There are uncovered public bike racks on Bankside and New Globe Walk, both 10 metres from the Theatre. There is also a Transport for London 'Barclay's Cycle Hire' docking point on New Globe Walk. The local stations are Mansion House on the District and Circle Lines (10 minute walk), London Bridge on the Northern and Jubilee Lines (10 minute walk), Southwark on the Jubilee Line (15 minute walk), and St Paul's on the Central Line (15 minute walk). The major local stations are London Bridge (10 minute walk), Cannon Street (15 minute walk), Blackfriars (15 minute walk) and Waterloo (25 minute walk). Where possible, visitors are advised to arrive by public transport or by taxi. There is an NCP car park on Upper Thames Street on the north side of Southwark Bridge. The car park closes at 7pm on Saturdays and Sundays. Limited parking is possible on New Globe Walk and the surrounding area on display of a blue disabled badge. Black cabs may be found all year round on Southwark Bridge. During the theatre season there is a regular supply of cabs outside the main foyer on New Globe Walk. Bankside Pier is 10 metres from the Theatre. There is a setting down point on Southwark Bridge, with approximately 40 uneven steps leading to the riverwalk. Wheelchairs can access Shakespeare's Globe by taking Sumner Street on the right beyond the bridge and turning right into Emerson Street which leads into New Globe Walk.